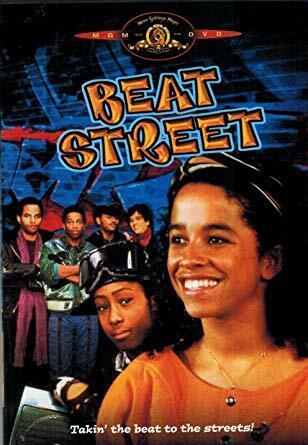 So I was wondering why I couldn’t remember a thing about Beat Street, a film that came out in the heat of the breakdancing movies in 1984. I knew I had to have seen it on cable, because I saw EVERY film on cable back then. Well, I finally got a copy of this breakdancing film starring Rae Dawn Chong, and now I understand why I couldn’t remember it–it’s a DOWNER! You get none of the colorful 80s cheese of Breakin or Body Rock. Sure you get plenty of flamboyant breakdance routines, but the film lacks the hokey upbeat vibe of the other films of the decade. Now I understand why reviewers on Amazon called it a “real” look at the breakdancing lifestyle. There’s no candy coating on this one. It’s pure ghetto gloom. Hell, someone even gets fried on the third rail of the train tracks! WTF? Who wants to know the real truth about urban life in the 80s? I want all my 80s ghetto movies to look like a Lionel Richie video! “We’re goin’ to…party…Karamu…fiesta…forever…” Yeah. 80s ignorance is bliss. Avoid this one! This entry was posted in Living in the 80s - forever, Movie Times & Television Schedules - Staying Entertained, Sound Check - The Songs Stuck in My Head and tagged 1980s, 80s, Beat Street. Bookmark the permalink.